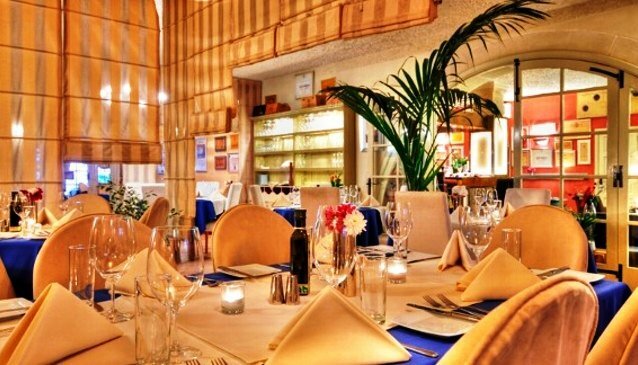 Patrick's restaurant (formerly known as it-Tmun Victoria) in Gozo's capital is a fine dining local favourite for all the right reasons. Patrick Buttigieg, the amiable chef patron, has been able to devise a winning formula of exquisite food, wide-ranging fine wines, striking decor, an intimate atmosphere and personalised service. The restaurant's achievements have been recognised in the many awards collected over a number of years, especially skewed towards its unmatched variety and exclusiveness of wines available. Apart from being a perfect companion to a good meal such as with one of Patrick's renowned perfectly cooked steaks, the wine can also be enjoyed over a chat and platter in the adjacent wine bar. The decor of Patrick's Lounge, Restaurant and Steakhouse is stylish and welcoming with classy hanging drapes lowered according to necessity and can create bespoke areas to accommodate a romantic dinner for two or larger areas for a private function. There is also a small terrace at the front and another back terrace which provide al fresco dining.